How GOOD would a massage feel right now ? Membership is free to our loyal clients who receive regular massages. “Loyalty Clients” are entitled to discount rates with fees based on your last treatment. Casey has been my sports massage therapist for quiet some time, during this time Casey has proven to certainly know his massage therapy as well as being a Personal Trainer which therefore understands a true Sports Massage . I have had many sports massages, but nothing stacks up to Casey. I am a Natural Body Builder and carpenter by trade, which as u could imagine between my weight training everyday and being on the tools it takes a toll on the body! So a massage assists with my muscle repair and release of lactic acid build up which needs to be released from the areas where Casey works firmly and deeply into my tissue. I’ve been working out with Casey for a year and a half. I started with Casey as I had a shoulder / lower neck injury that was causing headaches. Started a new business that entailed heavy lifting and also have low blood pressure. Casey helped me to strengthen the muscles around the shoulders to support injury. Strengthen my back and stomach to help prevent injury from lifting and worked out a program to minimize dizziness from low blood pressure. I have not suffered from headaches since working with Casey. And have a stronger and more toned body. He has also help with his remedial massage. If I have had a busy week and muscles are becoming tight. He is able to massage the knots out. I would highly recommend Casey as a trainer , as I have achieved the result I desired. 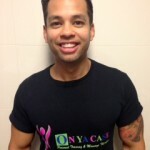 Hi I’m Casey from On Ya Case Personal Training & Massage Therapies and I am a passionate, dedicated & enthusiastic health and fitness professional, who is here to guide you to optimum health and well being.